In the software development process, the bug has a life cycle. Befor closing a bug, it should go through the life cycle .The bug attains different states in the life cycle. When a bug is raised for the first time, its state will be “NEW”. It means that the bug is not yet approved. 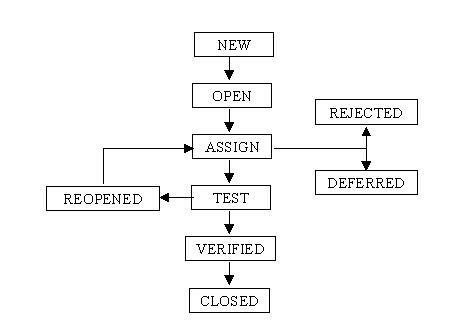 When a tester raised a bug, and his lead approves that the bug is genuine.Then the lead changes the state as “OPEN”. Once the lead changes the state as “OPEN”, he assigns the bug to corresponding developer or developer team. The state of the bug now is changed to “ASSIGN”. Once the developer fixes the bug, he has to assign the bug to the testing team for next round of testing i.e for Re testing and Regression testing. Before he releases the software with bug fixed, he changes the state of bug to “TEST”. It specifies that the bug has been fixed and is released to testing team. The bug, changed to deferred state means the bug is expected to be fixed in next releases. The reasons for changing the bug to this state have many factors. Some of them are priority of the bug may be low, lack of time for the release or the bug may not have major effect on the software. If the developer feels that the bug is not genuine, he rejects the bug. Then the state of the bug is changed to “REJECTED”. If the bug is repeated twice or the two bugs mention the same concept of the bug, then one bug status is changed to “DUPLICATE”. Once the bug is fixed and the status is changed to “TEST”, the tester tests the bug. If the bug is not present in the software, he approves that the bug is fixed and changes the status to “VERIFIED”. If the bug still exists even after the bug is fixed by the developer, the tester changes the status to “REOPENED”. The bug travells through the life cycle once again.